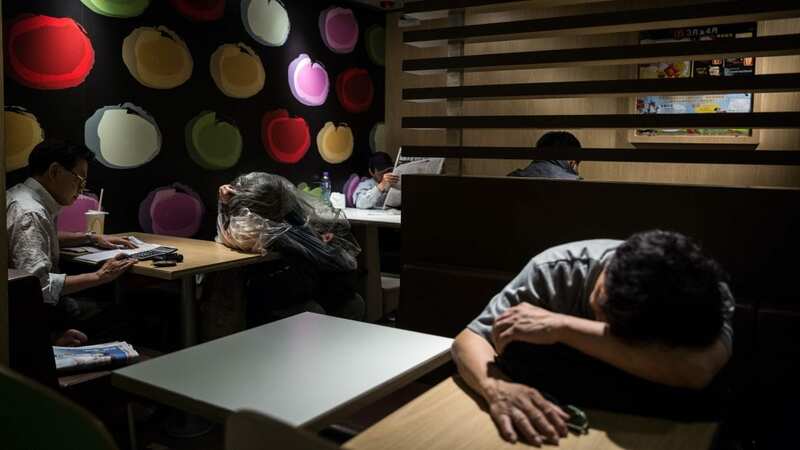 Hoping to escape Hong Kong’s summer temperatures, more people are settling into the city’s numerous 24-hour McDonald’s restaurants to soak in the air conditioning and get a decent night’s sleep. A new survey finds that the number of “McRefugees” or “McSleepers” –as they’ve been dubbed– has increased six-fold in the past five years. And, it’s not just the homeless. According to the survey, organized by the Junior Chamber International’s Tai Ping Shan branch and carried out by volunteers in June, the increase is mostly the result of the high-cost of air conditioning for people who already have a place to live in the Chinese territory, according to The South China Morning Post. The city has 110 McDonald’s outlets that are open 24 hours and they are reluctant to remove customers, even if they are not eating. “Researchers were able to interview 53 McRefugees aged between 19 and 79 in depth, and found 57 per cent of them had a job and 71 per cent of them had flats that they rented or owned, contrary to the common belief that these people tended to be jobless and homeless. The study found that 334 people had slept in a McDonald’s nightly over at least the three months that preceded the survey period. In the most recent study, the Post reports that one such person seeking refuge told the volunteer survey-takers that she rented a flat in To Kwa Wan in Kowloon but that the landlord charged her HK$16 ($2.02) per unit of electricity instead of the HK$1.10 (14 cents) charged by the city’s main power suppliers. The woman’s flat has no windows and is unbearable without air conditioning. Bad home situations and expensive electricity are creating more McRefugees, but the genuinely homeless still make up a large percentage of those filing the tables late at night in the restaurants as other patrons down their burgers and fries. In 2015, the death of an apparently homeless woman who was sleeping in a McDonald’s escaped notice for hours, prompting concern among social activists.